When I was down at LeNell’s this weekend looking for my next couple of bottles they were having an absinthe tasting – of St. George’s variety in particular. When I probed about the company, I found that not only were thy based in the US, but that they produced a single malt whiskey as well. So, taking a break from the march of bourbons, today I bring you St. George Single Malt Whiskey: the whiskey that wants to be a whisky. The first thing you’ll notice about SGSMW is that it does not appear to be American. The label features dragon clutching St. George’s cross and Celtic-esque script. The only clues to the beverage’s New World origins are the declaration of “Alameda, CA” on the back and the fact that they spell our beloved drink with the ‘e’. I can only think that this is deliberate. SGSMW is very light in color, a testament to its time spent in used bourbon and French oak barrels – it really stands out against my growing collection of Kentucky natives. To the nose, it is crisp and refreshing, like granny smith apples mostly. There are also hints from the bourbon casks in the honeyed patina. Maybe also the smell of a distant ocean. To the palate, the granny smiths are certainly there, but quickly followed by a nutty, nutmeg-like essence. Adding to the already full mouth feel is its sweet creaminess. Reminds me of drinking eggnog with good spiced rum in December. The flavors linger for some time – especially the crispness of the apple. I was pleased with St. George Single Malt Whiskey. It is not an intense whiskey, it’s full of bright and friendly flavors. I’d be interested to know how long it lived in the barrel and to try some differently aged varieties. I think there would be much more to be gotten from the bourbon casks. I do like that St. George did not feel obligated to take the traditional American route when producing its whiskey; it’s products like these that will allow the resurgence of whiskey consumption in this country to remain viable as more than a follow-on fad to Scotch. Alameda CA? American whiskey? I think you are too suspicious! I don’t claim to be an expert, and I haven’t even seen a bottle of SGSMW, but I AM reading a BBC article about it, which says it is made at St. George Distillery, Roudham, south Norfolk England. The BBC says it’s an English whiskey. My guess is that the American distributor is in Alameda, and that they may even bottle it there, but it’s still English. I was doubting you, but there ARE two St. George Distilleries, one in Alameda, and one in the UK. 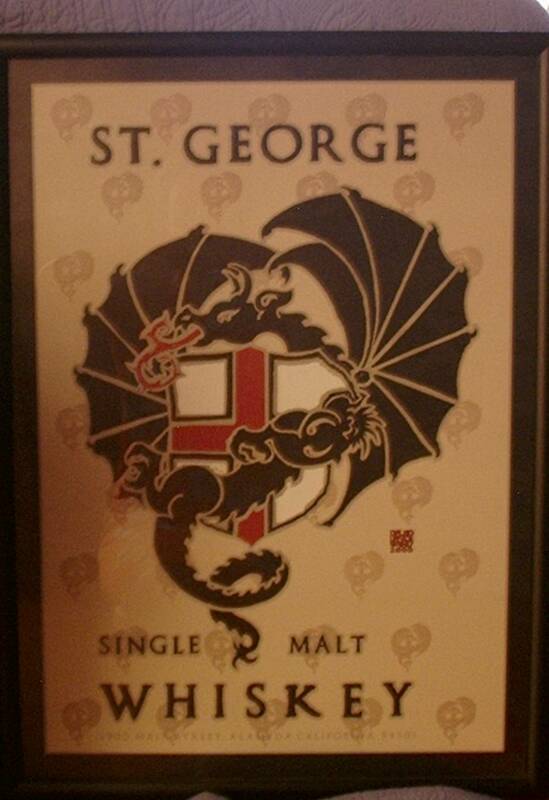 They both even have dragon labels, though St. George is slaying the one made in England, and both make a single malt. The American one is the image you show, with dragon and shield. Not a hard mistake to make, but Mea culpa. My mistake. See http://www.stgeorgespirits.com/ for the English version. Also, a “clue[s] to the beverage’s non-New World origins,” would not be Alameda, CA. Hah! That would be a clue to its New World origin (if it WERE made here), not to its non-New World origin. You must have been testing the product when you wrote this! For this whiskey I taste a lot of influence from the beer they use: chocolate malt, American hops (Cascade? ), and that eau de vie sense other folks have been talking about. I’d love to see what happens to this a little longer in the wood. Wow I am really the first reply to your incredible writing! ?